So we left later than usual and got into a bit of traffic. So fun! All the hawkers were selling their wares. I took notes of all they were selling . . . corn on the cob, ties, colorful handbags, fruit (mangoes, oranges, bananas, grapes), potato chips, a Scrabble game (! ), aprons, bottles of water, hats, dish towels, candies and this badminton racket-type thing which we think is an electric mosquito swatter. I was just about to roll down my window and ask if that is what it was when the traffic started moving. Darn! Other interesting things we saw . . . motorbikes zipping in and out and around and about. They function as delivery men and taxi men as well as for personal transportation. They wear helmets thank goodness! There are many kinds of taxis. . . there are motorbike taxis, uber taxis (which are very economical and convenient), 3-wheeled taxis, handcarts pulling people or goods, small buses called matatus (like the Jerusalem sheruts for those of you who've been to Jerusalem), and larger city buses. 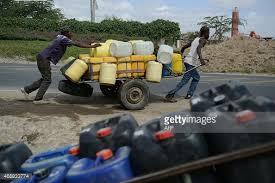 We've been encouraged NOT to take the matatus. Today on our way home, we saw cows grazing between the two lanes of traffic and men and women sweeping the sides of the streets with straw brooms. If the cows don't cut the grass on the mediums, then men go along and cut it with scythes. So interesting . . . living here in Nairobi. I'm going to add some internet pictures. I didn't have my camera with me today. 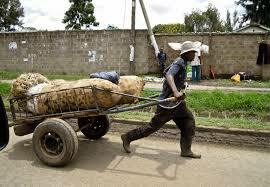 These Kenyan men are so STRONG! They pull or sometimes push handcarts loaded with goods (or people) up hill and down. Handcarts again. They share the road with hundreds of cars. Thank goodness the cars are only going 40-60 km/hr. Here's a matatu (toward the left). 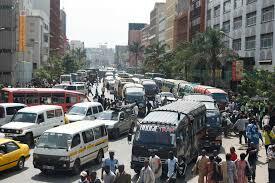 Nice picture of the traffic in downtown Nairobi. In Thailand we called these three-wheeled carts "tuk-tuks". Not sure what they're called here in Nairobi but they're all over the place. Wow! Sounds a bit crazy....!